Nobody wants to be that person holding the door open and breaking Muni, alarm blaring, multiple pairs of eyes throwing daggers, so this is generally good advice. 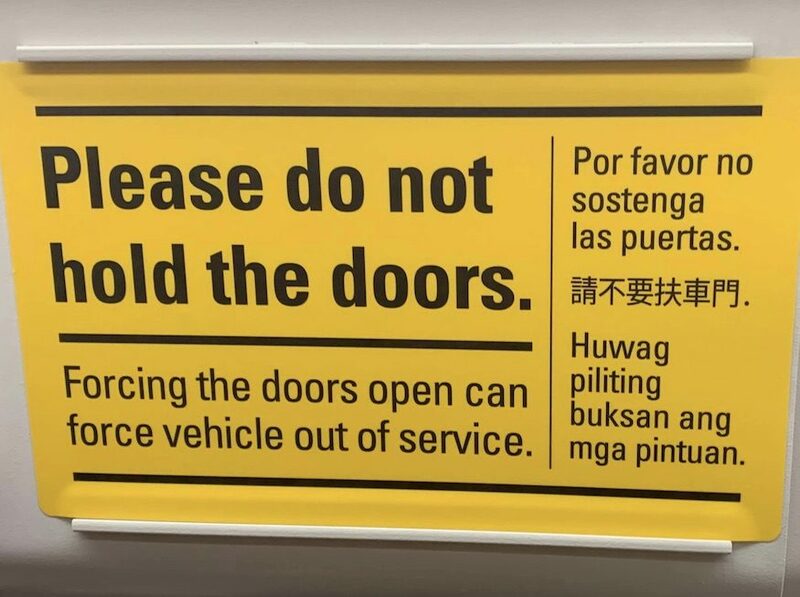 Being Chinese-speaking myself, I think the word “扶” can also mean “to physically hold.” Could the translation also be interpreted as, “Please do not lean on the doors”? Chinese-speaking riders, help us out: what should the sign really say? Saw something noteworthy on your ride? Your fellow riders want to know! Add your commute story to Muni Diaries by tagging us on Facebook, Twitter, Instagram; or you can email us at muni.diaries.sf@gmail.com. I’m not sure of the Cantonese, but in mandarin, the more standard version seems to be 严禁扒门 or 禁止掰门. Oddly parallel, based on google results for this, it’s often somewhat mistranslated into English as “Please don’t slap the door and force open”.